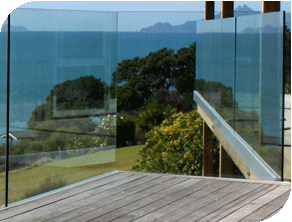 Order your custom frameless glass balustrade or glass staircase online today! We offer installation services in Auckland and deliver nationwide to Christchurch, Dunedin, Wellington and Hawkes Bay. 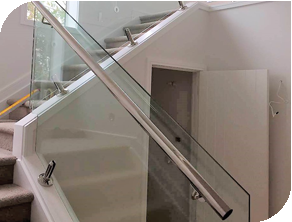 Frameless glass balustrades offer a stylish and secure alternative to traditional balustrades by giving a crystal clear view of your staircase, decking and balcony. 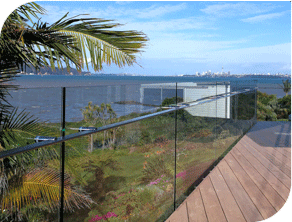 Grand Glass & Hardware Ltd are Auckland`s leading manufacturer, supplier & installer of frameless glass balustrade. All our materials have been engineered and designed to meet New Zealand Standards. We ship materials nationwide which includes Christchurch, Dunedin, Wellington, Queenstown, Nelson, Tauranga, Palmerston North, Northland and Hawkes Bay. 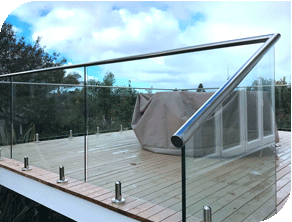 Based on the new regulation since 1st of June 2016, an interlink handrail is required for all types of frameless glass balustrade on ground over 1 metre high. 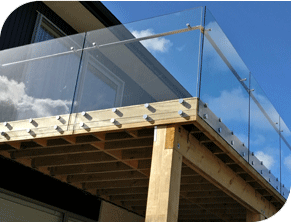 These products are suitable for your glass balcony or glass staircase. 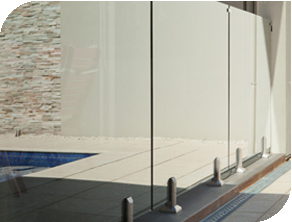 We also specialise in modern glass fences in New Zealand which are perfect for swimming pools. 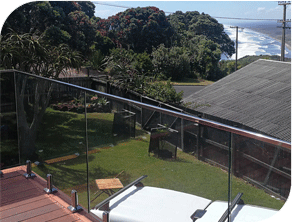 For the Round Mini Post Balustrade System, glass panels are installed on the top of floor/deck or balcony by Marine grade 2205 Stainless steel round mini posts. The glass panels will be 1000mm high and the finished height of balustrade will be around 1050mm from ground. In this type of Balustrade system, glass panels are installed on top of of deck or balcony by our Duplex 2205 Stainless Steel mini posts. Glass panels will be 12mm clear toughened and 1000mm high; Finished height of balustrade will be 1050mm from ground. 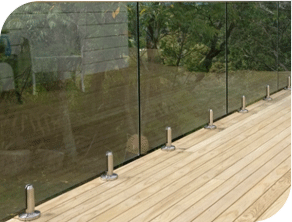 In this type of Balustrade system, glass panels are installed on top of of deck or balcony by our aluminium mini channels. The channels will be covered by continuous Stainless steel Cover plate in silver pearl powder coated; Glass panels will be 12mm clear toughened and 1000mm high; Finished height of balustrade will be around 1020mm from ground. Our flat offset rail system provide a turely stylish and unique touch of your project. 50mm * 10mm flat tube is connected to glass panel by bracket from inside of the balustrade. It is designed to maximise the views attainable through the balustrade whilst complying with the "interlinking rail" regulation. The Round Offset Rail system has 316 Stainless Steel round tube(38mm or 50.8mm diametre) connected to glass panels or wall with offset brackets. 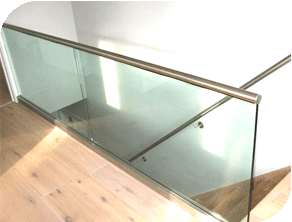 This product is meet the regulation of Interlink rail for glass balustrade and Handrail for stairs at same time.